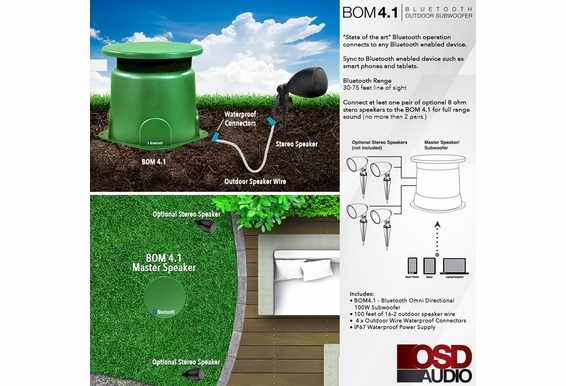 OSD Audio BOM4.1 All-weather Outdoor Bluetooth® Power Subwoofer and can power 4x Speakers, amplifier built in. OSD Audio's BOM4.1 All-weather Bluetooth® Subwoofer brings bass to your backyard, pool or patio so you can experience immersive audio even in noise-heavy environments. 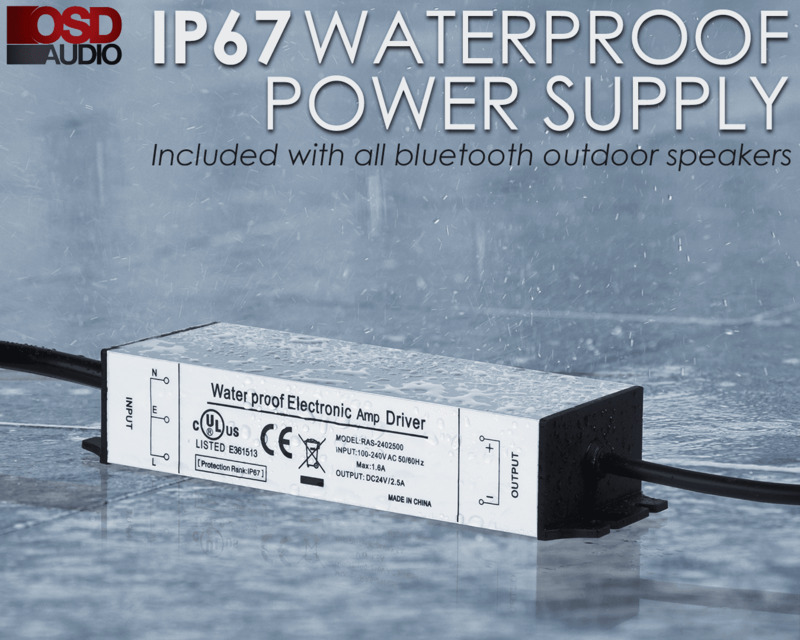 This is a beefy 100W outdoor sub is designed with weather-durable components, including an IP67-rated power supply that will last for years in cold, hot and wet climates. 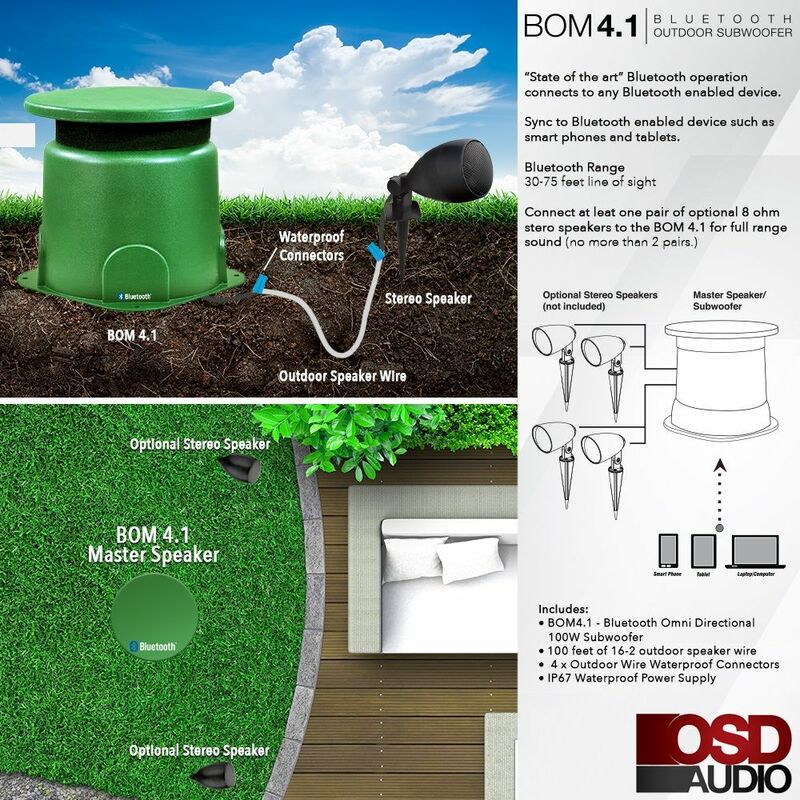 The BOM4.1 is also Bluetooth®4.0 enabled so no digging up the lawn or stapling cables through the deck. Simply plug it into an AC outlet and then pair this sub with your tablet or phone, and you'll enjoy the low frequency sound that's missing from your outdoor audio system. 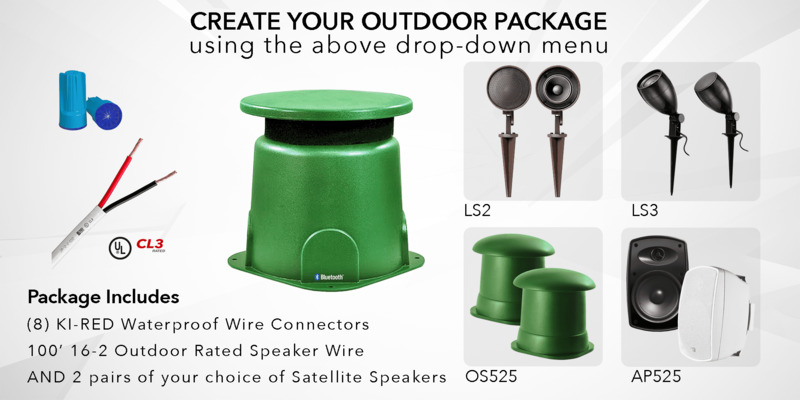 This is a great outdoor sub to add on to an existing sound system but also includes stereo outputs, so you can build up your outdoor audio with satellite speakers such as OSD LS2 landscape speakers. Why Add Dedicated Outdoor Subwoofer? The subwoofer is a dedicated bass speaker designed to handle the low frequency effects in audio systems and is the ï¿½.1ï¿½ in a 2.1, 4.1 or higher surround sound system. Adding a subwoofer is an extremely efficient and cost-effective way to improve otherwise thin-sounding outdoor speaker setups. In addition to delivering those spine-tingling bass notes, a subwoofer allows other speakers in your configuration to produce the frequency ranges they were designed to produce more efficiently. The result is less frequency roll off and more balanced and rich sound. If youï¿½re investing in an outdoor speaker, be sure that claims of water-proof or water resistance are backed up with an IP rating. 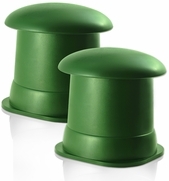 IP67 is an International Protection Rating given to products that meet certain criteria. 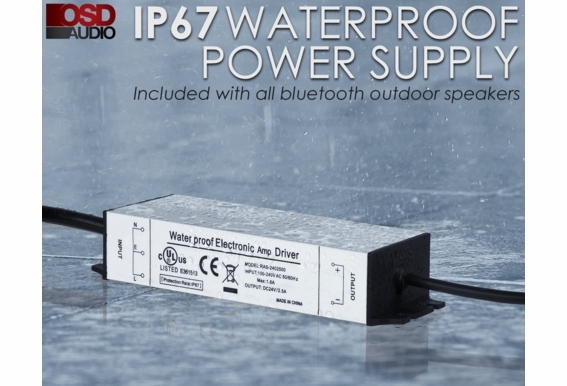 The BOM4.1 includes an IP67 rated power supply that is 100% protected against solid objects like dirt, dust and sand and has ï¿½been tested to work for at least 30 minutes after being immersed in water. This is particularly important in backyards with pools where water can damage or short out the power supply. Every environment is different, but we've tested our Bluetooth® sub unobstructed up to 75 feet and receive a clear audio signal. Your environment may have trees and other factors that can inhibit Bluetooth® transmission but line of sight transmission is generally between 35 and 75 feet. Pairing takes only a few minutes. Be sure the Bluetooth® device and the speakers are turned on and fully powered or fully charged. Bluetooth® controls are typically found in the device's Setting or Connections menu. The speakers will output a Bluetooth® Sync code that will be received by the Bluetooth® device and settings such as volume, mute, etc., are controlled directly from your phone, tablet or other Bluetooth®-enabled device. 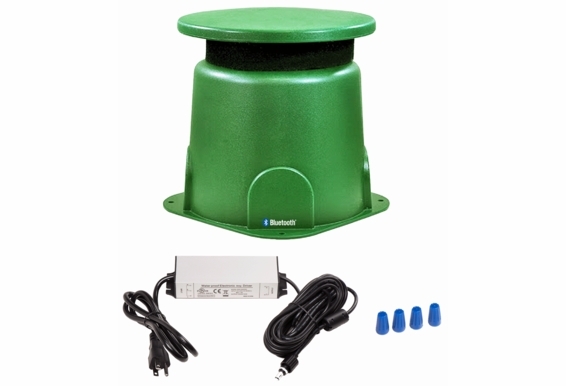 Power supply length: Plug to Transformer - 3' 5", Transformer to Speaker - 15' 5"
Dimensions: H 14.5" x W 12.5" x L 12.5"
Will this item be available in a different color or just green? 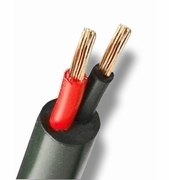 Do you sell an extension cable to allow for greater distance between the power adapter and the subwoofer? I was told that the only speakers you can use with the BOM4.1 were those listed as package options (LS2, LS3, AP525, or OS525). Is this true? If not, would a pair of rock style speakers work well with the BOM4.1 and, if so, which do you recommend? I plan to install the BOM4.1 and 2 pair of speaker along a retaining wall at the back of my pool (approx. 2' high x 80 ' long and 12' beyond the edge of the pool. Any additional suggestions would be appreciated. Similar to the pool in the attached photo. The picture of the pool under construction is mine. I canâ€™t download manual. Would like to know more about the Bluetooth pairing. Is there a button on the unit to put the Bluetooth receiver into pairing mode? What are the steps to connect to a different phone? Hello I just ordered the bom4.1 and 4 of you patio 6.5 my question is I have a large backyard and wanted to add one more pair of speakers. Can I run the speakers on two of the channels at different impedance to add the additional pair. ? I bought 1 of these a few months ago and love it. I have the planter speakers hooked up to it. What is the maximum number I can connect to this subwoofer? Also, can you use 2 of these simultaneously with 1 IPad? Just a couple questions. best setup for a large pool area for south florida (LOTS OF RAIN) , the speakers are hard wired to the sub?, length of the power cord for the sub. 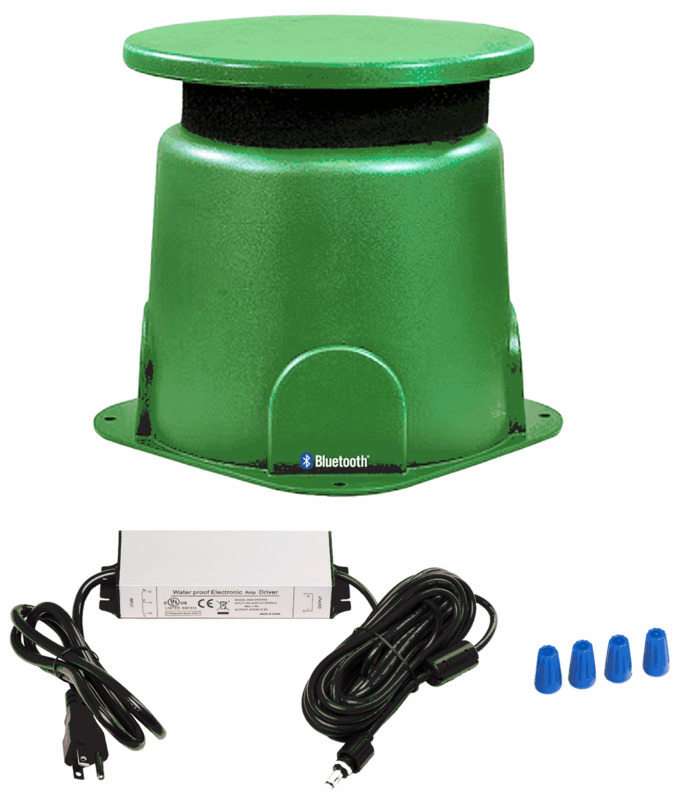 Iâ€™m looking to add either (2) pairs of AP525 or AP 650 with the BOM 4.1 for my outdoor pool/deck area. Is the sound noticeably better with the AP650 when compared to the AP525? 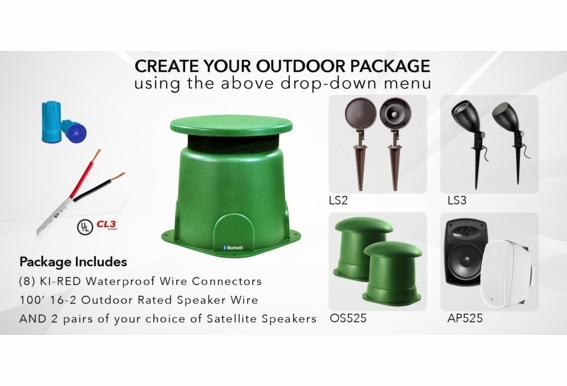 You offer a package option with the AP525 but not the AP650 so Iâ€™m trying to determine if the additional cost for the AP650 is with it or will the AP525 provide enough sound for my outdoor area. Will this work with the BTR-805s? What is the frequency crossover between the sub and speakers? Is there any way to adjust it? I am looking to enhance a new patio, approximately 15 x 17, with a sound system which will withstand Midwest weather. I am looking to use bluetooth capability so that I can use my smartphone to operate a wireless system. My wife loves to crank up the volume when she finds some music she enjoys. 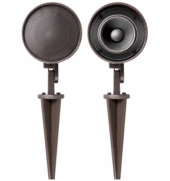 I was looking at the BOM4.1, with two sets of LS3 speakers, but I was not sure if that would be the best combination. She also likes the brown rock speakers if you have something that might sound better. Any advice? I have a large backyard pool area. Not needing party loud speakers but want good sound that can fill the area over pool noise. (I'm not an "audiophile"). For 4 speakers, I'm deciding between 2 OS525 or 2 OS800 (will be buried); and 2 RX550 or 2 RX670. My question is, will the bigger rock and omni directional speakers be a waste of money compared to the smaller ones, given the limit of 60W/speaker output of the BOM4.1? More specifically, will they, in fact sound louder and more clear than the smaller ones? Does this speaker need to be connected to a tuner or amplifier? Or does you just connect to phone and play? Is there anyway to make the speakers louder? I have 4 OS525 speakers hooked to the Sub. I have the volume on my phone turned all the way up but doesn't seem loud enough for my backyard. Can the BOM4.1 still be hooked up to a traditional receiver/amplifier or is it bluetooth-only? Does this have to be in the ground or can it be mounted about 10 feet in the air? Can I bury this unit in the same manner as os800 speaker instructions, 6"deep? What are the measurements of the speaker wire coming off the subwoofer? I need to get an idea of spacing the speakers out in my yard from the woofers location! Can wireless speakers be used with this unit or do they have to be wired? How can I see the manual for this product. The link on the web page does not work for me. the ad isn't clear to me. does this include 2 pair of the satellite speakers or just the connection for the 2 pair. Also is this a plug and play or do you need something else to power them? 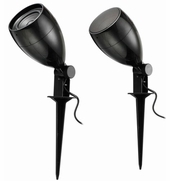 I researching options for outdoor audio for my patio/pool area. I see the satellite outputs are rated 60watts x 2 pair. Can you provide the wattage per channel? Is it 30 watts per channel? What speakers would you recommend matching to this (6.5" options and 8" options)? For my area, I likely will need 2 pairs plus the sub. Can this be connected to a TV or is it Bluetooth only?